Tackling the arms control implications of emerging technologies is becoming a matter of ever-increasing urgency as the pace of their development accelerates and their potential applications to warfare multiply. In every other generation, it seems, humans develop new technologies that alter the nature of warfare and pose fresh challenges for those seeking to reduce the frequency, destructiveness, and sheer misery of violent conflict. During World War I, advances in chemical processing were utilized to develop poisonous gases for battlefield use, causing massive casualties; after the war, horrified publics pushed diplomats to sign the Geneva Protocol of 1925, prohibiting the use in war of asphyxiating, poisonous, and other lethal gases. World War II witnessed the tragic application of nuclear technology to warfare, and much of postwar diplomacy entailed efforts to prevent the proliferation and use of atomic munitions. Today, a whole new array of technologies—artificial intelligence (AI), robotics, hypersonics, and cybertechnology, among others—is being applied to military use, with potentially far-ranging consequences. Although the risks and ramifications of these weapons are not yet widely recognized, policymakers will be compelled to address the dangers posed by innovative weapons technologies and to devise international arrangements to regulate or curb their use. Although some early efforts have been undertaken in this direction, most notably, in attempting to prohibit the deployment of fully autonomous weapons systems, far more work is needed to gauge the impacts of these technologies and to forge new or revised control mechanisms as deemed appropriate. In accordance with this dynamic, the United States and its rivals are pursuing multiple weapons systems employing various combinations of AI, autonomy, and other emerging technologies. These include, for example, unmanned aerial vehicles (UAVs) and unmanned surface and subsurface naval vessels capable of being assembled in swarms, or “wolfpacks,” to locate enemy assets such as tanks, missile launchers, submarines and, if communications are lost with their human operators, decide to strike them on their own. The Defense Department also has funded the development of two advanced weapons systems employing hypersonic technology: a hypersonic air-launched cruise missile and the Tactical Boost Glide (TBG) system, encompassing a hypersonic rocket for initial momentum and an unpowered payload that glides to its destination. In the cyberspace realm, a variety of offensive and retaliatory cyberweapons are being developed by the U.S. Cyber Command for use against hostile states found to be using cyberspace to endanger U.S. national security. The introduction of these and other such weapons on future battlefields will transform every aspect of combat and raise a host of challenges for advocates of responsible arms control. The use of fully autonomous weapons in combat, for example, automatically raises questions about the military’s ability to comply with the laws of war and international humanitarian law, which require belligerents to distinguish between enemy combatants and civilian bystanders. It is on this basis that opponents of such systems are seeking to negotiate a binding international ban on their deployment. Even more worrisome, some of the weapons now in development, such as unmanned anti-submarine wolfpacks and the TBG system, could theoretically endanger the current equilibrium in nuclear relations among the major powers, which rests on the threat of assured retaliation by invulnerable second-strike forces, by opening or seeming to open various first-strike options. Warfare in cyberspace could also threaten nuclear stability by exposing critical early-warning and communications systems to paralyzing attacks and prompting anxious leaders to authorize the early launch of nuclear weapons. These are only some of the challenges to global security and arms control that are likely to be posed by the weaponization of new technologies. Observers of these developments, including many who have studied them closely, warn that the development and weaponization of AI and other emerging technologies is occurring faster than efforts to understand their impacts or devise appropriate safeguards. “Unfortunately,” said former U.S. Secretary of the Navy Richard Danzig, “the uncertainties surrounding the use and interaction of new military technologies are not subject to confident calculation or control.”3 Given the enormity of the risks involved, this lack of attention and oversight must be overcome. Mapping out the implications of the new technologies for warfare and arms control and devising effective mechanisms for their control are a mammoth undertaking that requires the efforts of many analysts and policymakers around the world. This piece, an overview of the issues, is the first in a series for Arms Control Today (ACT) that will assess some of the most disruptive emerging technologies and their war-fighting and arms control implications. Future installments will look in greater depth at four especially problematic technologies: AI, autonomous weaponry, hypersonics, and cyberwarfare. These four have been chosen for close examination because, at this time, they appear to be the furthest along in terms of conversion into military systems and pose immediate challenges for international peace and stability. As AI-equipped machines assume an ever-growing number and range of military functions, policymakers will have to determine what safeguards are needed to prevent unintended, possibly catastrophic consequences of the sort suggested by Scharre and many others. Conceivably, AI could bolster nuclear stability by providing enhanced intelligence about enemy intentions and reducing the risk of misperception and miscalculation; such options also deserve attention. In the near term, however, control efforts will largely be focused on one particular application of AI: fully autonomous weapons systems. Looking further into the future, autonomous weapons systems could pose a potential threat to nuclear stability by investing their owners with a capacity to detect, track, and destroy enemy submarines and mobile missile launchers. Today’s stability, which can be seen as an uneasy nuclear balance of terror, rests on the belief that each major power possesses at least some devastating second-strike, or retaliatory, capability, whether mobile launchers for intercontinental ballistic missiles (ICBMs), submarine-launched ballistic missiles (SLBMs), or both, that are immune to real-time detection and safe from a first strike. Yet, a nuclear-armed belligerent might someday undermine the deterrence equation by employing undersea drones to pursue and destroy enemy ballistic missile submarines along with swarms of UAVs to hunt and attack enemy mobile ICBM launchers. Proposed hypersonic weapons, which can travel at a speed of more than five time the speed of sound, or more than 5,000 kilometers per hour, generally fall into two categories: hypersonic glide vehicles and hypersonic cruise missiles, either of which could be armed with nuclear or conventional warheads. With hypersonic glide vehicle systems, a rocket carries the unpowered glide vehicle into space, where it detaches and flies to its target by gliding along the upper atmosphere. Hypersonic cruise missiles are self-powered missiles, utilizing advanced rocket technology to achieve extraordinary speed and maneuverability. The development of hypersonic weaponry poses a significant threat to the core principle of assured retaliation, on which today’s nuclear strategies and arms control measures largely rest. Overcoming that danger will require commitments on the part of the major powers jointly to consider the risks posed by such weapons and what steps might be necessary to curb their destabilizing effects. Secure operations in cyberspace, the global web of information streams tied to the internet, has become essential for the continued functioning of the international economy and much else besides. An extraordinary tool for many purposes, the internet is also vulnerable to attack by hostile intruders, whether to spread misinformation, disrupt vital infrastructure, or steal valuable data. Most of those malicious activities are conducted by individuals or groups of individuals seeking to enrich themselves or sway public opinion. It is increasingly evident, however, that governmental bodies, often working in conjunction with some of those individuals, are employing cyberweapons to weaken their enemies by sowing distrust or sabotaging key institutions or to bolster their own defenses by stealing militarily relevant technological know-how. Cybersecurity, as perceived by U.S. leaders, can take two forms: defensive action aimed at protecting one’s own information infrastructure against attack; and offensive action intended to punish, or retaliate against, an attacker by severely disrupting its systems, or to deter such attack by holding out the prospect of such punishment. The U.S. Cyber Command, elevated by President Donald Trump in August 2017 to a full-fledged Unified Combatant Command, is empowered to conduct both types of operations. In many respects then, the cyber domain is coming to resemble the strategic nuclear realm, with notions of defense, deterrence, and assured retaliation initially devised for nuclear scenarios now being applied to conflict in cyberspace. Although battles in this domain are said to fall below the threshold of armed combat (so long, of course, as no one is killed as a result), it is not difficult to conceive of skirmishes in cyberspace that erupt into violent conflict, for example if cyberattacks result in the collapse of critical infrastructure, such as the electric grid or the banking system. The policy of other states in this regard is not so clearly stated, but similar protocols undoubtedly exist. Accordingly, management of this spillover effect from cyber- to conventional or even nuclear conflict will become a major concern of international policymakers in the years to come. To be sure, policymakers and arms control advocates will have their hands full in the coming months and years just preserving existing accords and patching them up where needed. At present, several key agreements, including the 1987 Intermediate-Range Nuclear Forces Treaty and the 2015 Iran nuclear accord are at significant risk, and there are serious doubts as to whether the United States and Russia will extend the 2010 New Strategic Arms Reduction Treaty before it expires in February 2021. Addressing these and other critical concerns will occupy much of the energy of key figures in the field for some time to come. As time goes on, however, policymakers will be compelled to devote ever-increasing attention to the military and arms control implications of the technologies identified above and others that may emerge in the years ahead. Diplomatically, these issues logically could be addressed bilaterally, such as through the currently stalled U.S.-Russian nuclear stability talks, and when appropriate in various multilateral forums. Developing all the needed responses to the new technologies will take time and considerable effort, involving the contributions of many individuals and organizations. Some of this is already underway, in part due to a special grant program on new threats to nuclear security initiated by the Carnegie Corporation of New York.22 Far more attention to these challenges will be needed in the years ahead. More detailed discussions of possible approaches for regulating the military use of these four technologies will be explored subsequently in ACT, but here are some preliminary thoughts on what will be needed. To begin, it will be essential to consider how the new technologies affect existing arms control and nonproliferation measures and ask what modifications, if any, are needed to ensure their continued validity in the face of unforeseen challenges. The introduction of hypersonic delivery systems, for example, could alter the mutual force calculations underlying existing strategic nuclear arms limitation agreements and require additional protocols to any future iteration of those accords. At the same time, research should be conducted on the possible contribution of AI technologies to the strengthening of existing measures, such as the nuclear Nonproliferation Treaty, which rely on the constant monitoring of participating states’ military and military-related activities. Finally, as the above discussion suggests, it will be necessary to devise entirely new approaches to arms control that are designed to overcome dangers of an unprecedented sort. Addressing the weaponization of AI, for example, will prove exceedingly difficult because regulating something as inherently insubstantial as algorithms will defy the precise labeling and stockpile oversight features of most existing control measures. Many of the other systems described above, including autonomous and hypersonic weapons, span the divide between conventional and nuclear munitions and raise a whole other set of regulatory problems. Addressing these challenges will not be easy, but just as previous generations of policymakers found ways of controlling new and dangerous technologies, so too will current and future generations contrive novel solutions to new perils. 1. Robert O. Work, “Preface,” in Artificial Intelligence: What Every Policymaker Needs to Know, ed. Paul Scharre and Michael C. Horowitz (Washington, DC: Center for a New American Security, June 2018), p. 2. 2. Paul McLeary, “USAF Announces Major New Hypersonic Weapon Contract,” Breaking Defense, April 18, 2018, https://breakingdefense.com/2018/04/usaf-announces-major-new-hypersonic-weapon-contract/. 3. Richard Danzig, Technology Roulette: Managing Loss of Control as Militaries Pursue Technological Superiority (Washington, DC: Center for a New American Security, 2018), p. 5. 4. For discussion of such scenarios, see Edward Geist and Andrew J. Lohn, How Might Artificial Intelligence Affect the Risk of Nuclear War? (Santa Monica, CA: RAND Corp., 2018), https://www.rand.org/pubs/perspectives/PE296.html. 5. For a thorough briefing on artificial intelligence and its military applications, see Daniel S. Hoadley and Nathan J. Lucas, “Artificial Intelligence and National Security,” CRS Report for Congress, R45178, April 26, 2018, https://fas.org/sgp/crs/natsec/R45178.pdf. 6. Paul Scharre, Army of None: Autonomous Weapons and the Future of War (New York: W.W. Norton, 2018), p. 305. 7. U.S. Department of Defense, “Autonomy in Weapon Systems,” no. 3000.09, November 21, 2012, http://www.esd.whs.mil/Portals/54/Documents/DD/issuances/dodd/300009p.pdf (directive). 8. For background on these systems, see Scharre, Army of None. 9. For a thorough explication of this position, see Human Rights Watch and International Human Rights Clinic, “Making the Case: The Dangers of Killer Robots and the Need for a Preemptive Ban,” 2016, https://www.hrw.org/sites/default/files/report_pdf/arms1216_web.pdf. 11. For discussion of this risk, see Geist and Lohn, How Might Artificial Intelligence Affect the Risk of Nuclear War? 12. Paul McLeary, “USAF Announces Major New Hypersonic Weapon Contract,” Breaking Defense, April 18, 2018, https://breakingdefense.com/2018/04/usaf-announces-major-new-hypersonic-weapon-contract/. 13. For more information on the Avangard system, see Dave Majumdar, “We Now Know How Russia's New Avangard Hypersonic Boost-Glide Weapon Will Launch,” The National Interest, March 20, 2018, https://nationalinterest.org/blog/the-buzz/we-now-know-how-russias-new-avangard-hypersonic-boost-glide-25003. 14. Kingston Rief, “Hypersonic Advances Spark Concern,” Arms Control Today, January/February 2018, pp. 29–30. 15. Richard H. Speier et al., Hypersonic Missile Nonproliferation: Hindering the Spread of a New Class of Weapons (Santa Monica, CA: RAND Corp., 2017), p. xiii. 16. For a discussion of possible measures of this sort, see ibid., pp. 35–46. 17. Andrew Futter, “The Dangers of Using Cyberattacks to Counter Nuclear Threats,” Arms Control Today, July/August 2016. 18. For a thorough briefing on cyberwarfare and cybersecurity, see Chris Jaikaran, “Cybersecurity: Selected Issues for the 115th Congress,” CRS Report for Congress, R45127, March 9, 2018, https://fas.org/sgp/crs/misc/R45127.pdf. 19. David Elliott, “Weighing the Case for a Convention to Limit Cyberwarfare, Arms Control Today, November 2009. 20. See Elaine Korzak, “UN GGE on Cybersecurity: The End of an Era?” The Diplomat, July 31, 2017, https://thediplomat.com/2017/07/un-gge-on-cybersecurity-have-china-and-russia-just-made-cyberspace-less-safe/. 21. Office of the Secretary of Defense, “Nuclear Posture Review,” February 2018, p. 21, https://media.defense.gov/2018/Feb/02/2001872886/-1/-1/1/2018-NUCLEAR-POSTURE-REVIEW-FINAL-REPORT.PDF. 22. Celeste Ford, “Eight Grants to Address Emerging Threats in Nuclear Security,” September 25, 2017, https://www.carnegie.org/news/articles/eight-grants-address-emerging-threats-nuclear-security/. 23. Speier et al., Hypersonic Missile Nonproliferation, pp. 42–44. Michael T. Klare is a professor emeritus of peace and world security studies at Hampshire College and senior visiting fellow at the Arms Control Association. This is the first in a series he is writing for Arms Control Today on the most disruptive emerging technologies and their implications for war-fighting and arms control. With Russia and the United States at an impasse, what can be done to save a landmark arms control treaty? U.S. President Donald Trump’s announcement on October 20 that he intends to have the United States “terminate” the Intermediate-Range Nuclear Forces (INF) Treaty took many European policymakers and security experts by surprise. Although European NATO allies now agree with the United States on the alleged Russian material breach of the treaty, the unilateral U.S. withdrawal threat is divisive within NATO. A technical solution is possible, but it does not appear to be politically feasible. Although the ultimate decision belongs to Washington, which has yet to deliver the official withdrawal notification to Russia, its execution will incur serious implications for European security, NATO cohesion, and the future of arms control. The landmark 1987 accord between the Soviet Union (now Russia) and the United States removed a major threat to European security by eliminating an entire class of ground-launched ballistic and cruise missiles, those with a range between 500 and 5,500 kilometers, together with their launchers. Although the INF Treaty is a cornerstone of European security, most European governments have remained on the sidelines in this dispute because, for one thing, no European NATO allies are party to the agreement. Hence, they do not see themselves as empowered to pressure Moscow or Washington publicly on solutions. Further, the INF Treaty is more of a political symbol to Europeans than a military restraint because they already are within range of Russia’s conventional and nuclear missiles. In addition, some European governments initially viewed the U.S. evidence of presumed Russian violation as not compelling enough.7 As a consequence, it took Washington more than three years to persuade its NATO allies. Finally and probably most importantly, European allies differ among themselves in their preferred approach toward Russia. Three weeks before the announcement, U.S. Defense Secretary Jim Mattis assured NATO allies that any U.S. decision on the INF Treaty would be made “in concert with our allies, as always.”15 Yet, the White House acted unilaterally. As a result, the announcement only adds another setback to relations between the Trump administration and European allies, for whom display of NATO unity and solidarity is of utmost importance when facing Russia. If the threat of withdrawal succeeds in bringing Russia back to compliance, it will certainly be an achievement that could reinvigorate arms control more broadly. Nevertheless, the attempt is risky. If it fails, its consequences could generate predominantly unfavorable side effects for Europe without visible advantages on the horizon. First, the threat of withdrawal will not automatically bring Russia back to compliance; an actual withdrawal even less so. At the same time, dumping the treaty means that the United States and subsequently NATO give up the legal basis on which they are entitled to insist on Russia’s return to compliance. No INF Treaty means no possibility to pressure Moscow on the elements of its alleged missile and limits avenues to verify whether it violated the treaty. Second, without the INF Treaty, Russia could freely field an unlimited number of the allegedly developed intermediate-range cruise missiles in the vicinity of Europe, while NATO has neither offensive nor defensive capablities with which to credibly respond in the short term. Third, no European government has offered to host U.S. INF Treaty-range missiles. According to NATO Secretary-General Jens Stoltenberg, “NATO has no intention to deploy new nuclear missiles in Europe.”16 Yet, the potential appetite of some European governments to capitalize on hosting conventional intermediate-range cruise missiles, should the United States decide to field them, could deepen NATO’s divide and play into Moscow’s hands. Fourth, what happens with the INF Treaty will likely determine the future of arms control. The death of the INF Treaty without solving the compliance issue could impede prospects for extending existing agreements, such as the New Strategic Arms Reduction Treaty (New START), and negotiating new ones. Finally, the way NATO deals with the INF Treaty reflects on its credibility and leadership within the nuclear Nonproliferation Treaty (NPT) regime. Just last year, European NATO allies stood side by side with United States in opposition to the Treaty on the Prohibition of Nuclear Weapons, aligning themselves with the position that a step-by-step approach on nuclear disarmament is a better course. With the U.S. termination of the Iran nuclear deal, an INF Treaty deathwatch underway, and an extension of New START in question, the standing of NATO’s nuclear and non-nuclear countries as trustworthy partners, although differently, will be heavily at stake. Can the INF Treaty Be Saved? Because diplomatic, economic, and military measures have not prompted Russia to address compliance concerns in a sufficient manner, announcing the intent to withdraw appears a logical consequence. Yet, not only is its timing questionable, but both sides have failed to exhaust all potential avenues to address mutual concerns. Yet, such a solution might be far more complicated. The United States now publicly alleges that Moscow initially flight tested the 9M729 to distances well over 500 kilometers from a fixed launcher and then tested the same missile at ranges below 500 kilometers from a mobile launcher. By putting the two types of tests together, Russia was able to develop a missile that flies more than 500 km and launches from a ground-mobile platform, which would put it in violation of the INF Treaty.23 If Moscow were to offer credible exhibitions of the alleged missile that show it to indeed be noncompliant with the INF Treaty, the logical outcome would require Russia to eliminate the missiles plus halt any further testing, production, and deployment. If Russia does not agree to mutual verification, the United States and its NATO allies could reclaim the moral high ground by demonstrating that Moscow, not Washington, is scrapping arms control treaties. This seems like a pragmatic offer because the United States is convinced of its own compliance and because, in other spheres, military transparency is such a point of pride for the United States and NATO. Initiating goodwill on NATO side, however, will be no a small feat. Allies predominantly blame Russia for the current state of the INF Treaty. After countless unsuccessful attempts to reach out to Moscow, they consider the ball to be in Russia’s court.24 Also, winning NATO unanimity on such a proposal will be politically challenging. Furthermore, allies endeavor not to create any impression of getting back to what they call “business as usual” with Moscow, and any offer going beyond the current agenda could be seen as crossing this line. Yet, apart from the INF Treaty, NATO has nothing to lose. With the accord in severe jeopardy, the alliance faces the “need to assess the implications of the new Russian missile,” according to Stoltenberg.25 Such an assessment has military and arms control dimensions. The motivation for the alleged Russian breach remains largely unclear. Successive U.S. administrations have not attributed a motive either. Only the recent U.S. Nuclear Posture Review report states that “Moscow believes these systems may provide useful options for escalation advantage.”26 A new, land-based, INF Treaty-range missile could compliment already existing Russian sea- and air-launched cruise missiles with additional mobility and agility, more difficult detection capabilities, and reduced warning time,27 enabling a faster or surprise attack (e.g., against U.S. Aegis Ashore installations in Europe). European allies and Washington reportedly have been weighing a set of some three dozen military and diplomatic responses to the Russian breach.28 The former could include extending NATO ballistic missile defense with capabilities to defend against cruise missiles, increasing the readiness level of NATO dual-capable aircraft proscribed for its nuclear mission, strengthening the credibility of U.S. extended nuclear deterrence in Europe, deploying a conventional INF Treaty-range ground-launched cruise missile in Europe,29 and introducing new nuclear sea-launched cruise missiles to the U.S. arsenal.30 Except for cruise missile defense,31 however, these measures would neither directly defend Europe from noncompliant Russian cruise missiles nor plausibly be explained as a response to the INF Treaty violation. To some degree, military responses could worsen NATO-Russian relations. Additional military measures bear the risk of fueling Moscow’s sense of being under siege and thus leading to a Russian military counterreaction. Pledges to refrain from deploying INF Treaty-class missiles in Europe, provided the other side does not deploy them, would be one option to mitigate an unnecessary and costly arms spiral in Europe. The demise of the INF Treaty and internal NATO deliberations over an appropriate response could require reopening a broader discussion on the NATO deterrence and defense posture. Allies went through this difficult process a decade ago and were barely able to find agreement. Although the security situation differs today from when NATO perceived Russia its “partner,” reopening such discussions holds the potential risk of strengthening the role of nuclear weapons, an issue tremendously sensitive for individual NATO allies. At the same time, the current INF Treaty crisis marks yet another blow to the European security architecture and raises a more general question: What shall future arms control look like? Should the INF Treaty eventually collapse, Europe and the United States could offer Moscow the chance to work on a modern successor. Utilizing the INF Treaty as a blueprint, they could think of limiting the number of intermediate-range missiles instead of banning them completely, limiting cruise missile deployments geographically, prohibiting nuclear-tipped cruise missiles, or multilateralizing and extending the treaty’s scope. Such a preservation effort should not be seen as a reward for Russia’s bad behavior. Rather, it should be recognized as an investment in preventing an arms race, as a step to realize the European commitment to nuclear nonproliferation and disarmament, and as a way for Europe to remain central in shaping the global nuclear weapons landscape. As with the Iran nuclear accord, Europe has a major role to play and a major stake in the outcome. 1. U.S. Department of State, “2014 Report on Adherence to and Compliance with Arms Control, Nonproliferation, and Disarmament Agreements and Commitments,” July 2014, https://www.state.gov/documents/organization/230108.pdf. 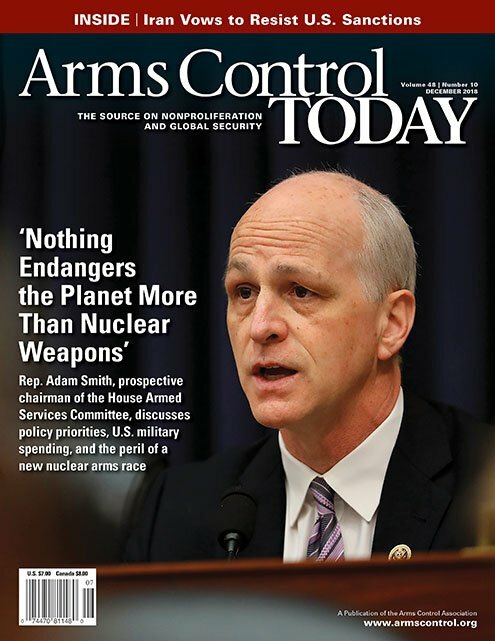 See Gen. Paul Selva, Testimony before the House Armed Services Committee, March 8, 2017, https://armedservices.house.gov/legislation/hearings/military-assessment-nuclear-deterrence-requirements. See also Gen. John E. Hyten, Testimony before the Senate Committee on Armed Services, March 20, 2018, https://www.armed-services.senate.gov/imo/media/doc/Hyten_03-20-18.pdf. 2. Ministry of Foreign Affairs of the Russian Federation, “Comment by the Russian Ministry of Foreign Affairs Regarding the Report of the U.S. Department of State on Adherence to and Compliance With Arms Control, Nonproliferation, and Disarmament Agreements and Commitments,” August 1, 2014, http://www.mid.ru/en/foreign_policy/news/-/asset_publisher/cKNonkJE02Bw/content/id/675835. 3. U.S. Department of State, “INF Diplomacy Highlights Timeline,” November 16, 2018, https://www.state.gov/t/avc/inf/287411.htm. 4. U.S. Department of State, “Refuting Russian Allegations of U.S. Noncompliance With the INF Treaty,” November 16, 2018, https://www.state.gov/t/avc/inf/287413.htm. 5. Ministry of Foreign Affairs of the Russian Federation, “Russia’s Assessment of the U.S. Department of State’s Report on Adherence to and Compliance With Arms Control, Nonproliferation, and Disarmament Agreements and Commitments,” April 14, 2018, http://www.mid.ru/en/foreign_policy/news/-/asset_publisher/cKNonkJE02Bw/content/id/3192916. See “Russian Ambassador Calls U.S. Accusations of INF Treaty Violation ‘Ungrounded,’” Tass, March 2, 2018. 7. U.S. Mission to NATO, “October 2, 2018: Press Briefing by Ambassador Kay Bailey Hutchison,” October 2, 2018, https://nato.usmission.gov/october-2-2018-press-briefing-by-ambassador-kay-bailey-hutchison/. 8. German Federal Foreign Office, “Foreign Minister Maas on the U.S. Announcement That It Is Withdrawing From the INF Treaty,” October 21, 2018, https://www.auswaertiges-amt.de/en/newsroom/news/maas-inf-treaty/2151874, German Federal Government, “Zur Ankündigung der USA, sich aus dem INF-Abkommen zurückzuziehen,” October 21, 2018, https://www.bundesregierung.de/breg-de/suche/zur-ankuendigung-der-usa-sich-aus-dem-inf-abkommen-zurueckzuziehen-1540744. 9. German Federal Foreign Office, October 24, 2018, https://twitter.com/AuswaertigesAmt/status/1055114684083462144; German Federal Foreign Office, “Preventing a New Arms Race,” October 23, 2018, https://www.auswaertiges-amt.de/en/newsroom/news/maas-funke-mediengruppe-inf-treaty/2152660. 11. Embassy of France in London, “France Reminds U.S. of Nuclear Treaty’s Importance,” October 21, 2018, https://uk.ambafrance.org/France-reminds-US-of-nuclear-treaty-s-importance. 12. Peter Stubbly, “UK Stands 'Absolutely Resolute' With the U.S. After Trump Pulls Out of Russia Nuclear Weapons Treaty,” Independent, October 21, 2018. 13. “Jacek Czaputowicz: Polska ze zrozumieniem dla decyzji USA w sprawie INF,” PolskieRadio24.pl, October 22, 2018, https://polskieradio24.pl/5/3/Artykul/2205658,Jacek-Czaputowicz-Polska-ze-zrozumieniem-dla-decyzji-USA-w-sprawie-INF. 14. NATO, “Brussels Summit Declaration,” July 11, 2018, https://www.nato.int/cps/en/natohq/official_texts_156624.htm. 15. “U.S. Withdrawal From Nuke Treaty Worries Europeans,” Der Spiegel, October 30, 2018. 16. NATO, “Keynote Speech by NATO Secretary General Jens Stoltenberg at the ‘NATO Talk Around the Brandenburg Tor’ Conference,” November 12, 2018, https://www.nato.int/cps/en/natohq/opinions_160241.htm. 17. U.S. Department of State, “Intermediate-Range Nuclear Forces (INF) Treaty,” n.d., https://www.state.gov/t/avc/inf/index.htm (accessed November 22, 2018). 18. U.S. Department of State, “Trump Administration INF Treaty Integrated Strategy,” December 8, 2017, https://www.state.gov/r/pa/prs/ps/2017/12/276363.htm. 19. U.S. Department of State, “INF Diplomacy Highlights Timeline,” November 16, 2018, https://www.state.gov/t/avc/inf/287411.htm. 20. German Federal Government, “Regierungspressekonferenz vom 22. Oktober 2018,” October 22, 2018, https://www.bundesregierung.de/breg-de/suche/regierungspressekonferenz-vom-22-oktober-2018-1541072. See NATO, “Press Conference by NATO Secretary General Jens Stoltenberg Ahead of Exercise Trident Juncture 2018,” October 24, 2018, https://www.nato.int/cps/en/natohq/opinions_159666.htm?selectedLocale=en. 21. U.S. Department of State, “Refuting Russian Allegations of U.S. Noncompliance With the INF Treaty,” November 16, 2018, https://www.state.gov/t/avc/inf/287413.htm. 22. European Leadership Network, “ELN Group Statement: A European Response to U.S. Withdrawal From the INF Treaty,” November 7, 2018, https://www.europeanleadershipnetwork.org/group-statement/eln-group-statement-a-european-response-to-us-withdrawal-from-the-inf-treaty/; “Letter to POTUS on US-RF Arms Control 11-7,” November 7, 2018, https://drive.google.com/file/d/1kdGky0NumiWz4MWwyFNirxP9NTB9a37h/view; “Statement of the Deep Cuts Commission on the INF-Treaty Crisis and the Way Forward,” November 16, 2018, http://deepcuts.org/files/pdf/Statement_of_the_Deep_Cuts_Commission_on_the_INF_Treaty_final.pdf; “No Nuclear Arms Race in Europe!” n.d., https://kein-wettruesten.de/en/ (accessed November 22, 2018). 24. NATO, “NATO-Russia Council Beets in Brussels,” October 31, 2018, https://www.nato.int/cps/en/natohq/news_160005.htm?selectedLocale=en. 26. Office of the Secretary of Defense, “Nuclear Posture Review,” February 2018, p. 9, https://media.defense.gov/2018/Feb/02/2001872886/-1/-1/1/2018-NUCLEAR-POSTURE-REVIEW-FINAL-REPORT.PDF (hereinafter NPR Report). 28. Lena Kampf and Georg Mascolo, “Nato: Russlands Atomprogramm verstößt gegen Abkommen,” Süddeutsche Zeitung, August 31, 2017. 31. Because cruise missile defense is not an off-the-shelf-product, its development would require years. Only the U.S. Congress has shown an interest in funding the development of active defenses to counter ground-launched missile systems within the INF Treaty ranges. See National Defense Authorization Act for Fiscal Year 2018, Pub. L. No. 115-91, 131 Stat. 1283 (2017). Katarzyna Kubiak is a policy fellow on nuclear and arms control policy at the European Leadership Network in London. Energy Department shifts to cheap plutonium-disposal plan. Are the administration’s nuclear weapons plans achievable and affordable? The estimated cost of the Energy Department’s plans to sustain U.S. nuclear warheads and their supporting infrastructure has risen sharply over the past year, adding to concerns about affordability. The department’s semi-autonomous National Nuclear Security Administration (NNSA) on Nov. 1 released the sixth version of its annual report on the Stockpile Stewardship and Management Plan. The fiscal year 2019 iteration projects more than $390 billion in spending on agency efforts related to sustaining and modernizing the nuclear weapons stockpile over the next 25 years. This is an increase of $70 billion, or 22 percent, from the 2018 version of the plan. The new NNSA plan begins to reflect the recommendations of the 2018 Nuclear Posture Review (NPR) report released in February, which called for developing two additional low-yield nuclear capabilities, retaining the B83-1 nuclear gravity bomb, and expanding the NNSA’s plutonium-pit production capacity. (See ACT, March 2018.) These initiatives are part of a proposed expansion of NNSA nuclear weapons work that the report says would provide “capabilities needed to quickly produce new or additional weapons” beyond the 3,800 warheads currently in the active U.S. nuclear stockpile. Like the GAO, former NNSA Administrator Frank Klotz raised concern about the level of demands on the NNSA in coming years envisioned by the Trump administration. “The agency is “working pretty much at full capacity, and you can draw your conclusion from that,” he said in an interview with Defense News two days after leaving office in January and before the release of the NPR report. The largest source of projected growth in the new stockpile plan is in the area of nuclear and non-nuclear production facility modernization, including new plutonium-pit production, uranium processing, and uranium-enrichment facilities. Whereas last year the agency projected $8.6 billion to $39.3 billion in spending, including the effects of inflation, on these and other facilities, it now estimates the cost at $61.1 billion to $90.7 billion. The NNSA plan also foresees an increase in spending relative to the 2018 version on warhead life extensions programs through the beginning of the 2020s even as it follows the NPR report in backing away from a controversial proposal to develop three interoperable warheads for deployment on land- and sea-based ballistic missiles as part of the so-called 3+2 strategy. Since 2013, the NNSA had planned to jointly replace the W78 intercontinental ballistic missile (ICBM) warhead and the W88 submarine-launched ballistic missile (SLBM) warhead with a new interoperable warhead known as IW-1. Two subsequent interoperable warheads were slated to replace the W87 and W76 warheads. Instead, the NPR report called for accelerating replacement of the W78 by one year to support deployment on the Air Force’s new ICBM by 2030 “and investigate the feasibility of fielding the nuclear explosive package in a Navy flight vehicle.” The report did not commit developing additional common warheads. The fiscal year 2019 energy and water appropriations bill, signed by President Donald Trump in September, called on the NNSA to produce a report estimating the cost of a possible, less expensive alternative to the current plan to replace the W78.